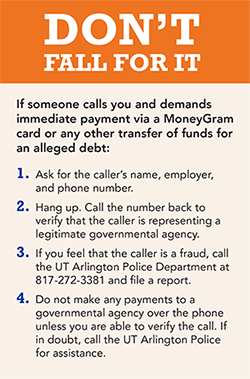 UT Arlington students are being targeted by a sophisticated phone scam in which the callers identify themselves as members of a governmental agency, then threaten to arrest students on false or fictitious charges if immediate payment is not made to the suspects via a money card. Ten students have reported providing payments to the suspects over the phone. Combined losses thus far total $20,000. One student lost more than $6,000. Dozens of additional students have reported similar calls from individuals posing as representatives of local law enforcement agencies, state agencies, the Internal Revenue Service (IRS), and other federal agencies. Some calls have targeted international students. However, offenses are being reported by students of varying backgrounds. If you or anyone you know has information related to these crimes, call the UT Arlington Police Department at 817-272-3381. UT Arlington students elected Emmalie Moe, psychology sophomore, as president and James Ruedlinger, communication studies sophomore, as vice president of Student Congress for the 2015-16 academic year. Other election winners include Danish Dawood, accounting senior, and Kaajal Patel, finance sophomore, for Mr. and Ms. UTA. See other election results in The Shorthorn. The annual Block Party moved inside because of storm threats Thursday. The rain didn't come but fun sure did. 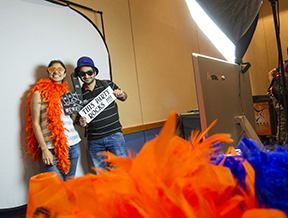 The Bluebonnet Ballroom was filled with photo and video ops, games, and live music. Prices for 3-D prints have dropped from $0.35 per gram to $0.05 per gram at the UTA FabLab in the Central Library. The cost applies to the library's stock of ABS 3-D-print filament. If you bring your own roll of ABS, use of the printer is free. Student Legal Services now provides immigration attorneys for consultations with students each month. Experienced immigration attorneys will waive their fee for an initial consultation. Students will be allowed to have one free consultation each year. The next consultation day is 10 a.m.-noon and 1:30-3:30 p.m. Wednesday, April 22. Email keishaware@uta.edu to reserve a session. Complete the required form by noon today, Tuesday, April 21. The forms are available by email and in the Student Legal Services Office, Room 216, Davis Hall. The LGBTQA Program recognizes graduation candidates at the annual Lavender Graduation and Award Ceremony. The dinner and awards ceremony is 5:30-7 p.m. Tuesday, April 28, Carlisle Suite, E.H. Hereford University Center. Students graduating in 2015 must RSVP by Thursday, April 23. A rainbow stole will be provided free to graduating students. 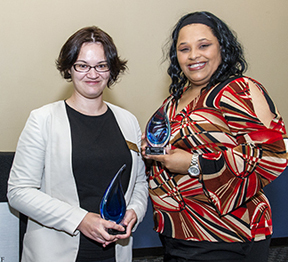 Assistant Professor Evguenia Malaia, left, and Angeleah Chavis-McCray were honored as Outstanding Academic Advisers last week. Dr. Malaia was named Outstanding Faculty Adviser and is graduate adviser for curriculum and instruction in the College of Education. Chavis-McCray was chosen Outstanding Professional Adviser and is adviser for mathematics in the College of Science. Honorable mentions for professional adviser went to Barrie Hill and Melinda Long in communication, College of Liberal Arts; Megan Janky, university studies, University College; and Steve Latos, social work, education, and kinesiology, University Advising Center. Receiving honorable mention for faculty advising were Bethany Shaffer, lecturer in English in the College of Liberal Arts, and Beverly Black, the Jillian Michelle Smith Professor in Family Violence Research and director of the Ph.D. program in the School of Social Work. Lots 30 and 33 will be used for the Starquest Dance Event parking at Texas Hall beginning at 6 a.m. Thursday-Sunday, April 23-26. In addition, Lots F9, Trinity, and Trinity South will be used starting at 6 a.m. Saturday-Sunday, April 25-26. Parking staff will collect a fee at each lot. However, all UT Arlington annual permits will be valid in these lots without an additional charge. The University Housing Office is hiring students who live on campus to be housing tour guides, work at the Housing Office front desk, and staff marketing events. Housing Ambassadors must live in UTA residence halls or apartments. Apply online for ID 8148 on Snap Job by 5 p.m. Friday, April 24. Supplemental applications also must be completed. Bring the form to the Housing Office in the E.H. Hereford University Center by 5 p.m. Monday, April 27. The Office of University Recruitment is hiring MavElite tour guides. Tour guides manage the Dan Dipert University Welcome Center, work recruitment events, and give tours to prospective students, school and community groups, VIP guests, and others. The position is posted on Snap Job as ID 8125. Applications are due Friday, April 24. UT Arlington students, faculty, staff, and alumni can enjoy selected Texas Rangers games with discounted tickets. Visit texasrangers.com/grouptickets, click on University of Texas at Arlington, and use the password GOMAVS to get your discounted tickets. Sportscaster Bob Costas reviewed highlights from his career and described sports as “drama without a script" at last week's Maverick Speakers Series presentation at College Park Center. He added, “It unifies people, and it’s something that can be shared across generations.” ﻿Charlotte Jones Anderson, executive vice president/chief brand officer for the Dallas Cowboys, moderated the discussion. Watch the video. University departments and student organizations may sign up for a table at the summer Involvement Fair at New Maverick Orientation for transfer students. The fairs are an opportunity for you to speak with incoming students regarding your organization, program, or service. Visit uta.edu/sao to sign up your group and for detailed information. Sign-ups for the Involvement Fairs during summer will open Monday, April 27. UT Arlington is an early voting site for the May 9 joint election. The polling site will be open from 8 a.m.-5 p.m. Tuesday, April 28-Thursday, April 30, in the Maverick Activities Center. To vote early on campus, you must be registered to vote in Tarrant County and must present identification such as a voter registration certificate, driver's license, birth certificate, passport, U.S. citizenship papers, a current utility bill, bank statement, government check, or other government document. For more information on early voting, see votetexas.gov and Tarrant County elections. Contact Student Congress at 817-272-0556 with any questions. The UTA Bookstore remains open during its renovations, which include adding a new Starbucks Café. The bookstore will be open regular hours with east and west entrances open. Park at the College Park District garages or retail parking lots for the next two months. Motivated students are needed to become peer educators with TRIO-Student Support Services and University Tutorial and Supplemental Instruction. Peer educators are students who are successful in their courses and have completed at least one semester at UTA. All students must have an A or B in the course for which they are applying. Positions include one-on-one tutors, small group tutors/mentors, and Supplemental Instruction leaders. If you think you would be a good peer educator, go to uta.edu/tutoringjobs. The application deadline for all peer educator positions is Thursday, April 30. Last day for classes of spring semester. Last day for graduate students to submit their approved thesis or dissertation and to submit a report of their final master’s exam or dissertation defense. Final exams for spring semester. Final grades posted for spring semester. First day of classes for summer intersession. Commencement tickets for students who applied to graduate in May are now available. Detailed instructions on how to claim your graduate and guest tickets were sent to your UT Arlington email account Monday, April 20. Visit the Commencement website for details on ticket quantities and availability. If you experience technical difficulty claiming your tickets, contact the Box Office at 817-272-9595. Commencement ceremonies are Thursday-Saturday, May 14-16, in College Park Center. Priority registration for summer and fall terms has begun. Advising is available in your academic department. Check for your appointment time on the registration timetable, which is available in your MyMav Student Center, along with information on whether you need to see an academic adviser before you’re eligible to register. A list of academic advising offices is online. The MyMav schedule of classes is being updated daily. Plan to validate your course selections when registration opens. Summer intersession begins Wednesday, May 20. Class dates are online. To register for summer intersession classes, click on the Additional Search Criteria link on the schedule of classes page. The Schedule of Classes link is on the right. Final grades for the spring semester are scheduled to be available after noon Wednesday, May 20. View grades by logging in to MyMav. When the grades are official, a notice will be posted on the Records and Registration website. Grades are sometimes viewable before all end-of-term processes are completed, so check that they have been announced as official. Celebrating People and Planet, UTA's Earth Day event, is set for 11 a.m.-1 p.m. Wednesday, April 22, on the University Center mall. Local environmental vendors will be on hand to pass along their messages. Learn about the latest in celebrating the Earth at booths for the Environmental Protection Agency, the Fort Worth Native Plant Society, Whole Foods, and many more. The T Master Plan bus will be there. Grab an herb plant while they last. The popular Earth Day T-shirts and food are available for purchase. Jazz Combo Concert Free. 7:30 p.m., Irons Recital Hall, Fine Arts Building. Music. Opera Workshop Performance Opera students perform. Free. 7:30 p.m., Irons Recital Hall, Fine Arts Building. Also, Thursday, April 23. Music. Small Painting Sale Advanced painting students offer small art. Graduating students offer larger works for sale. 5:30-8 p.m., Room 122, Studio Art Center, 810 S. Davis. Art and Art History. Take Back the Night Survivors and their supporters share their stories of violence, survival, and recovery. Also, poster making, a march through campus, and candlelight vigil. 6-8 p.m., Library mall. Relationship Violence and Sexual Assault Prevention. MavPlays: Collected One-Acts Theater works written, directed, and performed by the Maverick Theatre Company. Tickets $7 students, faculty, staff, seniors; $10 public. For tickets, call 817-272-2669. 8 p.m., Stage 143, Fine Arts Building. Also, 2:30 p.m. Sunday, April 26. Theatre Arts. Friday Night Film: 'American Sniper' Rated R. Free, fresh-popped popcorn while supplies last; other concessions for sale. Tickets $1, $1.50 with credit card. 7 p.m., Rosebud Theatre, E.H. Hereford University Center. EXCEL Campus Activities. Wind Symphony Concert Tickets $9 for adults, $5 for students and seniors. 7:30 p.m., Irons Recital Hall, Fine Arts Building. Music. MavPlays: 'Wrong Turn at Lungfish' Theater works written, directed, and performed by the Maverick Theatre Company. Tickets $7 students, faculty, staff, seniors; $10 public. For tickets, call 817-272-2669. 8 p.m., Studio Theatre, Fine Arts Building. Also, 2:30 p.m. Sunday, April 26. Theatre Arts. UTA Symphony Orchestra Tickets $9 for adults, $5 for students and seniors. 7:30 p.m., Irons Recital Hall, Fine Arts Building. Music. MavPlays: 'Trifles' and 'Waiting for Lefty' Theater works written, directed, and performed by the Maverick Theatre Company. Tickets $7 students, faculty, staff, seniors; $10 public. For tickets, call 817-272-2669. 2:30 p.m., Studio Theatre, Fine Arts Building. Theatre Arts. Symphonic Winds and Symphonic Band Concert Free. 5 p.m., Irons Recital Hall, Fine Arts Building. Music. Faculty Violin Recital Martha Walvoord, associate professor of violin, performs. Free. 7:30 p.m., Irons Recital Hall, Fine Arts Building. Music. String Chamber Ensembles Recital Free. 7:30 p.m., Irons Recital Hall, Fine Arts Building. Music. UTA Choir Concert Tickets $9 for adults, $5 for students and seniors. 7:30 p.m., Irons Recital Hall, Fine Arts Building. Music. Baseball Mavericks vs. Arkansas-Little Rock. Tickets $5-7; $3 students. 6:30 p.m., Clay Gould Ballpark. Also, 2 p.m. Saturday, May 2; 1 p.m. Sunday, May 3. Athletics. Guest Bass Recital Nick Scales of West Texas A&M performs. Free. 7:30 p.m., Irons Recital Hall, Fine Arts Building. Music. Softball Mavericks vs. Texas State. Tickets $5-7; $3 students. 1 and 3 p.m. Saturday, May 2, and noon Sunday, May 3, Allan Saxe Field. Athletics. Baseball Mavericks vs. Appalachian State. Tickets $5-7; $3 students. 6:30 p.m. Friday, May 8; 2 p.m. Saturday, May 9; 1 p.m. Sunday, May 10; Clay Gould Ballpark. Athletics. BFA Art Exhibit The work of 43 Bachelor of Fine Arts candidates includes painting, drawing, sculpture, glass, printmaking, film/video, photography, digital imaging, and visual communication. Hours 10 a.m.-5 p.m. Mondays-Fridays, noon-5 p.m. Saturdays. Monday, May 4-Saturday, May 16. The Gallery at UTA. MFA Art Exhibit Master of Fine Arts candidates present a culminating exhibition demonstrating excellence in film/video, glass, intermedia, and visual communication. Hours 10 a.m.-5 p.m. Mondays-Fridays, noon-5 p.m. Saturdays. The Gallery at UTA, Fine Arts Building. Through Saturday, April 25. The Gallery at UTA. MavsArt The semi-annual UTA community art show features 67 works by 25 artists who are UTA students, faculty, and staff. Through May 15. UT Arlington Libraries, MavsArt. Special Collections: !Viva Mexico! A Comic Book History of Mexico A rare look inside the rise of comic books in 20th century Mexico, their literary, cultural, and entertainment value, and influence by the Mexican government. Hours 9 a.m.-7 p.m. Mondays, 9 a.m.-5 p.m. Tuesdays-Saturdays, sixth floor, Central Library. Through Aug. 8. UT Arlington Libraries Special Collections. Juneteenth in Texas: 150 Years of Freedom More than 60 photographs explore issues of Texas African-Americans from Emancipation to the Civil Rights era. Hours 9 a.m.-5 p.m. Through Aug. 9. Sixth floor, Central Library. Center for Greater Southwestern Studies. Planetarium The spring schedule features Black Holes, Dynamic Earth, Pink Floyd, Secret of the Cardboard Rocket, and Spacepark 360: Infinity. Planetarium. Advising: Service Learning Free. 11:30 a.m., first floor lobby, Ransom Hall. Also, 1:30 p.m. Thursday, April 23; 10:15 a.m. Friday, April 24. University Advising Center. Writing: Editing and Revising Free. 6:40 p.m., second floor, Central Library. Writing Center. AAFSA Lecture Series Froswa' Booker-Drew, national community engagement director at World Vision for U.S. programs, speaks on facilitating the emergence and strengthening of community-led initiatives to improve and sustain the well-being of children and their families. Free. Noon-1 p.m., sixth floor parlor, Central Library. African American Faculty and Staff Association. MavsTalk: Depression Register or join day of event. 3:30-4:30 p.m., Room 104, Preston Hall. Counseling and Psychological Services. Biology Colloquium Alex Wild of UT Austin presents "How the Digital Revolution is Reviving Natural History." Free. 4-5 p.m., Room 124, Life Science Building. Also, David D. Pollock of the University of Colorado Denver, "Molecular Convergence, Adaptation, and Coevolution," Thursday, April 30. Biology. Writing: Conjunctions Free. 6:40 p.m., second floor, Central Library. Writing Center. Walter Prescott Webb Lecture Series "Beyond Attics and Activists: Rethinking Family in Disability History." Rio Grande Ballroom, E.H. Hereford University Center. History, Disability Studies, Office for Students with Disabilities, Women's and Gender Studies, Movin' Mavs Adapted Sports and Recreation. Major Exploration Seminar Discuss resources for choosing a major with an adviser. Free. 2 p.m., Room 104, Preston Hall. University College. Adventures in Antiquity Symposium Richard Bett of Johns Hopkins University presents “Socratic Ignorance.” Free. 3:30 p.m., Room 2102A, Fine Arts Building. Philosophy and Humanities. Guest Artist Lecture Internationally renowned artist Janine Antoni discusses her works. 7 p.m., Room 148, Fine Arts Building. Art and Art History. Advising: Prepping for Finals Free. 1:30 p.m., first floor lobby, Ransom Hall. Also, 11:30 a.m. Thursday, April 30; 10:15 a.m. Friday, May 1. University Advising Center. Mavs Talk: Grief Register or join day of event. 3:30-4:30 p.m., Room 104, Preston Hall. Counseling and Psychological Services. Mathematics Lecture David Eisenbud of the University of California, Berkeley and director of the Mathematical Sciences Research Institute presents “Counting From Infinity: A Non-Technical Account of a Mathematical and Personal Triumph.” Clips of the movie Counting from Infinity: Yitang Zhang and the Twin Prime Conjecture shown. Free. 5-6 p.m., Room 100, Nedderman Hall. Office of the Provost. Arlington Technology Association George Siemens, executive director of the Learning Innovation and Networked Knowledge (LINK) Research Lab, explores how education is changing due to massive open online courses (MOOCs), big data, digital networks, and the Internet. Light breakfast provided. RSVP. Free. 7-8 a.m., Wednesday, May 6, Room 100, Nedderman Hall. Arlington Technology Association. Social Work Colloquium Jeffrey Jenson is guest speaker at the Colloquium on Agency Collaboration and Community-Based Human Service Innovation. He will discuss the public health approach for preventing child and adolescent health and behavior problems and preventive interventions aimed at promoting positive youth development. Dr. Jenson is the Philip D. and Eleanor G. Winn Professor for Children and Youth at Risk at the University of Denver. Register online. 1-4 p.m. Thursday, May 7, Room 107, Social Work Complex General Academic Building. Social Work. Honors and dedication: Top left, center Rebekah Van Dijk was named to the 2015 Full Court NCAA Division I Women’s Mid-Major Freshman All-American team. Top right, junior Cody Farrell went 4-for-5 with three RBIs and two runs in Sunday’s 10-7 victory over Troy. 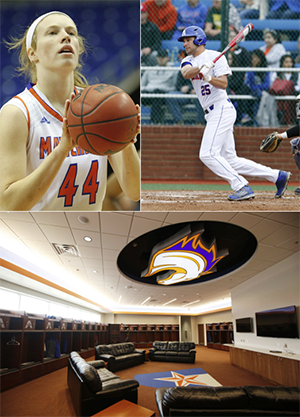 At bottom, UT Arlington baseball unveiled its new clubhouse with a ribbon-cutting ceremony before Friday's rain-delayed game at Clay Gould Ballpark. The complex features nearly 6,000 square feet of state-of-the-art facilities that include a players clubhouse, an equipment and laundry room, a sports medicine training room, and coaches' offices. Former sportscaster and UTA alumnus George Riba is guest speaker for the All-Sports Banquet at 6 p.m. Monday, April 27, at College Park Center. The banquet recognizes the successes of student-athletes for their athletic and academic achievement and community involvement. Tickets are $20 for adults and $10 for students. For table sponsorships, contact Kris Wood at 817-272-9613 or kriswood@uta.edu. Awards continue to roll in for center Rebekah Van Dijk, who last week was named to the 2015 Full Court NCAA Division I Women’s Mid-Major Freshman All-American team. She also earned the Sun Belt Conference Freshman of the Year award and was an All-SBC second-team selection. Van Dijk averaged 13.2 points and 10.4 rebounds a game last season and led all Division I freshmen with 15 double-doubles. Facing a six-run deficit in the second inning of Sunday’s rubber match against Troy, UTA stormed back for a 10-7 victory at Clay Gould Ballpark. Junior Cody Farrell went 4-for-5 with three RBIs and two runs. The Mavericks and Trojans split a doubleheader Saturday, with UTA winning the first game 15-4 but losing the second 7-6. The Mavericks are 17-21 overall and 8-10 in the Sun Belt Conference. They visit Texas A&M today, Tuesday, April 21, before beginning a weekend series Friday, April 24, at Louisiana-Lafayette. The softball team’s late rally came up short Sunday in a 5-4 loss to Georgia State at Allan Saxe Field. The Mavericks earned a doubleheader split Saturday, winning the second game 5-2 after losing the first 6-1. Senior Nina Villanueva scored twice to become the first UTA player with 50 runs in a season. The team is 27-22 overall and 8-10 in the Sun Belt Conference. The Mavericks face Troy in a three-game series beginning Saturday, April 25, in Troy, Ala. The women’s tennis team dropped a 4-3 decision Sunday to South Alabama in the finals of the Sun Belt Conference Championship in New Orleans. UTA advanced to the finals with a 4-1 victory over Troy on Friday and a 4-3 win against Georgia State on Saturday. The team ended its season with a 16-6 record. In men’s action, the Mavericks lost 4-1 Saturday to South Alabama in the Sun Belt semifinals. The men finished with a 12-7 record. • The golf team is tied for fourth after two rounds of the Sun Belt Conference Championship at Raven Golf Club in Miramar Beach, Fla. Two rounds were played Monday after weather washed out Sunday's opening round. • The men’s and women’s track teams turned in solid performances Saturday at the Michael Johnson Classic in Waco before inclement weather shortened the event. The teams compete Saturday, April 25, at the Bobcat Classic in San Marcos. Upcoming entry deadlines for intramural sports include FIFA video game, Wednesday, May 6; and poker tournament, Thursday, May 7.